Kate Moss' style has been replicated by countless designers and young girls, the most famous being her collaboration with TopShop from 2007-2011. Kate mixes sundresses with gumboots for festival chic, diamonds with denim, slips under trench coats. Luella Bartley says [about Kate] "She is genuinely charismatic. She lives the rock and roll dream...but is kind, without an ounce of snobbery attached to her. To know her is to be utterly entranced by her." I think what I love most about Kate is her attitude to Fashion, every look she creates really seems to be reflective of a particular character and transcends all ideals of what 'trends' are, given that she starts many of them herself. "I'm not really a fashion designer. I just love clothes. I've never been to design school. I can't sketch. I can't cut patterns and things. I can shorten things. I can make a dress out of a scarf. " -Kate Moss for Louis Vuitton at Paris Fashion Week via eatkate. 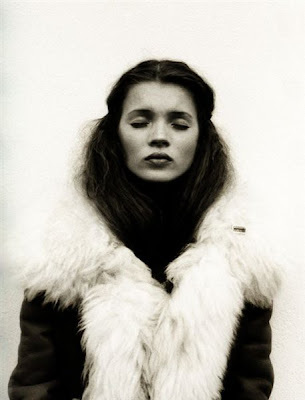 -Kate Moss by Corinne Day & for Mango via We Heart It. -Kate as a Ballerina from Tumblr.